In the mid-summer of 1989 the German Democratic Republic-- known as the GDR or East Germany--was an autocratic state led by an entrenched Communist Party. A loyal member of the Warsaw Pact, it was a counterpart of the Federal Republic of Germany (West Germany), which it confronted with a mixture of hostility and grudging accommodation across the divide created by the Cold War. Over the following year and a half, dramatic changes occurred in the political system of East Germany and culminated in the GDR's "accession" to the Federal Republic itself. Yet the end of Germany's division evoked its own new and very bitter constitutional problems. 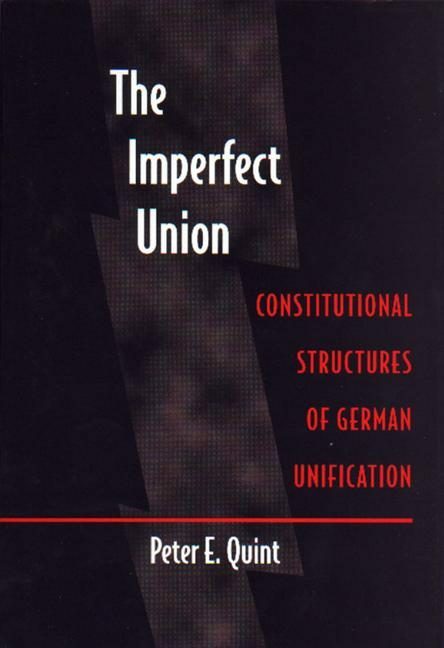 The Imperfect Union discusses these issues and shows that they are at the core of a great event of political, economic, and social history.Part I analyzes the constitutional history of eastern Germany from 1945 through the constitutional changes of 1989-1990 and beyond to the constitutions of the re-created east German states. Part II analyzes the Unification Treaty and the numerous problems arising from it: the fate of expropriated property on unification; the unification of the disparate eastern and western abortion regimes; the transformation of East German institutions, such as the civil service, the universities, and the judiciary; prosecution of former GDR leaders and officials; the "rehabilitation" and compensation of GDR victims; and the issues raised by the fateful legacy of the files of the East German secret police. Part III examines the external aspects of unification.